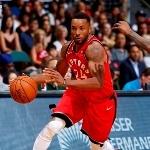 Kyle Lowry returned from injury to help the Toronto Raptors extend a run of home dominance over the Indiana Pacers, but it was Norman Powell who stole the show. Powell scored a season-high 23 points, Pascal Siakam had 12 points and 10 rebounds, and the Raptors beat Indiana 121-105 on Sunday night, snapping the Pacers’ six-game winning streak. Serge Ibaka scored 18 points, while Lowry had 12 points and eight assists after missing the previous six games because of a sore lower back. Kawhi Leonard rested on the second night of a back-to-back, but Lowry played 32 minutes and shot 4 for 10, going 2 for 6 from 3-point range. Lowry also had three steals and three rebounds and took a pair of charges. The Pacers lost their 11th consecutive game north of the border. Indiana’s most recent win Toronto was March 1, 2013. Danny Green scored 15 points and Fred VanVleet had 12 as the Raptors returned from a victory in Milwaukee on Saturday to win their fifth straight at home. Powell made 10 of 12 shots and scored 11 points in the final quarter. Green matched his season high with five 3-pointers and Toronto hit 17 of 33 from long range, one shy of its season best. It was the fifth time this season the Raptors have faced a team that had won at least five straight games. Toronto is now 3-2 in such encounters, also beating Miami on Dec. 26 and Milwaukee on Saturday. Bojan Bogdanovic scored 21 points, Domantas Sabonis had 16 points and 11 rebounds, and Oladipo scored 16 points for Indiana. The Pacers have lost five straight and 14 of the past 16 against the Raptors. Thaddeus Young scored 14 points and Darren Collison had 11. Indiana has won 13 of its past 16, losing twice to Toronto and once to Cleveland in that span. The Raptors rallied from a 17-point deficit to beat the Pacers 99-96 on Dec. 19. Both teams shot better than 60 percent in the first quarter, but the Raptors made six of nine attempts from 3-point range to lead 37-35. Powell scored 10 points in the second and Toronto led 70-63 at halftime. Ibaka had 10 in the third as the Raptors took a 96-84 edge into the final quarter. On Tuesday night the Pacers will visit the Cleveland Cavaliers while the Raptors will host the Atlanta Hawks.